2019 has been not kind on Delmarva on the weekends, but this trend actually started back in 2018. The tough find to a dry weekend has actually gotten harder starting last summer and has persisted into this winter. Starting in April 2018, Delmarva was actually fairly dry during the weekends but also beginning to build a slight deficit on the rainfall gauge for the year. This dry pattern continued into the 1st half of May, which actually led to some areas on the peninsula to be abnormally dry. Starting on Mother´s Day weekend, the weather pattern began to change bringing rain for both days. During the summer, Delmarva would experience stretches of dry and wet weekends fairly evenly. 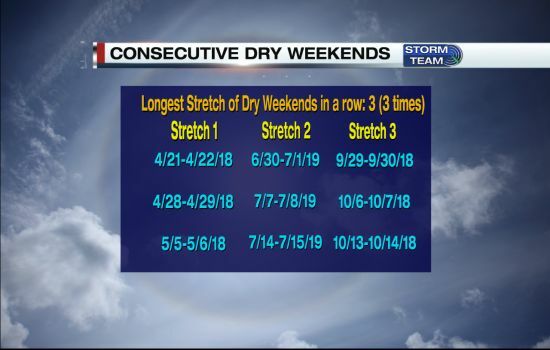 The longest stretch of dry weekends over the past year has been 3, which occurred on 3 separate occasions. The scales would be tipped one way in October, when the weekends would become noticeably wetter and unfortunately this routine has continued into 2019. The longest wet stretch over the past year has been 5 which has occurred in 2 separate occasions. 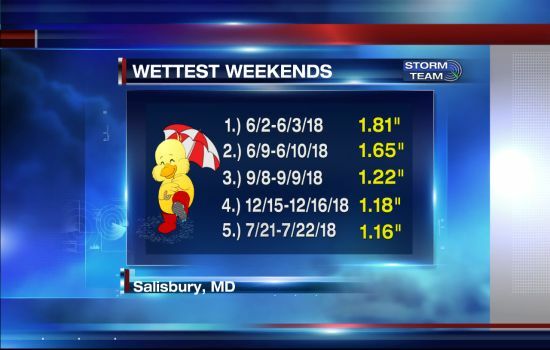 The last time Delmarva experienced 4 and 5 weekends in a row of dry weather was all of March of 2018. 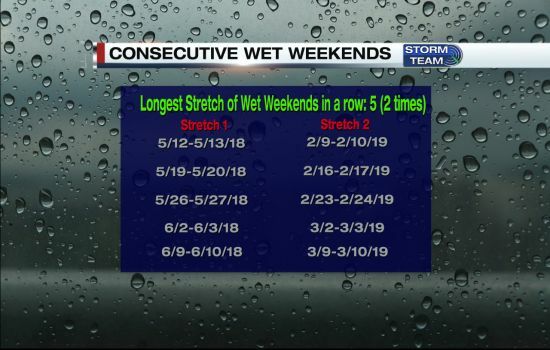 Since April 1st, 2018, which has been 51 weekends, 30 have been wet and 21 have been dry. The last time we had drier over wetter weekends, was on the weekend before Mother´s Day which was 3 dry and 2 wet. Since October 20th, which was over a week after Michael, Delmarva has battled with 8 dry and 14 wet, which is almost a 2:1 ratio. A blog earlier this month focused on how we have had 8 wet weekends in 2019, without finishing the 1st quarter of the year. The most surprising analysis of the weekend rainfall, is that despite the wetter weekends the heavier amounts take place on weekdays. There has only been 5 weekends with rainfall totals over 1 inch, with the 2 heaviest taking place in June. Weekend rainfall totals over the last 9 months of 2018, was 13.39¨ which only accounted for about 30% of the total amount (45.23¨). The heaviest weekend in 2019, has a total amount of 0.90 which actually occurred in 2 consecutive weekends on the last weekend of February and 1st weekend in March. You are probably beginning to wonder even though the heaviest rain does not occur weekends, which day of the weekend gets poured on most. Based on the data over the past 12 months, Sunday has been wetter at 8.99¨ while Saturday is at 8.23¨. But if you break it down from 2018 vs 2019, Saturday was the heavier day in 2018 at 7.42¨ while Sunday was at 5.97¨. Sunday by a long shot has been the winner thus far on the weekends so far in 2019 with 3.02¨, compared to 0.81¨. 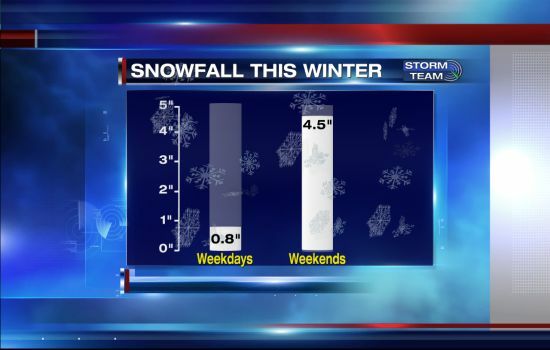 We take the data one step further, showing that the majority of this winter snowfall has taken place over the weekends. Our biggest storm of the season back on January 12th and 13th brought 3.7¨of the 5.3¨this season. An earlier storm in December which took place on a Sunday brought 0.8¨, totaling our weekend snow totals to 4.5¨ or almost 85% of our season totals. Early signs on the models indicate Delmarva could be in for its 5th dry weekend of 2019, but also its 1st stretch of 3 consecutive dry weekends of the year for next weekend. Even though, wet weekends have been more common than dry weekends in these last 12 months, trends can always change especially as we get deeper into this year. Make sure to stay tuned to our Storm Team for the latest forecast throughout the week.